The majestic Catskill Mountains hover over the west bank of the Hudson River as it winds its way south. These gentle peaks with their deep ravines, irregular ridges and rocky slopes long remained wild and desolate. Although small settlements began here prior to the American Revolution the real population boom did not begin until after the war. 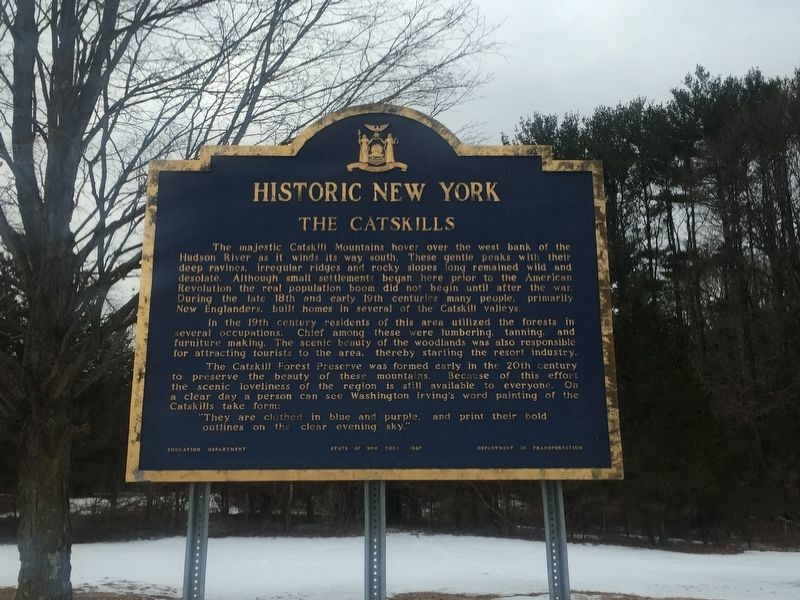 During the late 18th end early 19th centuries many people, primarily New Englanders, built homes in several of the Catskill valleys. In the 19th century residents of this area utilized the forests in several occupations. Chief among these were lumbering, tanning, and furniture making. The scenic beauty of the woodlands was also responsible for attracting tourists to the area, thereby starting the resort industry. "They are clothed in blue and purple, and print their bold outlines on the clear evening sky"
Erected 1967 by Education Department/State of New York/Department of Transportation. Location. 42° 16.169′ N, 73° 56.926′ W. Marker is in Cairo, New York, in Greene County. Marker is on Pine Street (New York State Route 23), on the right when traveling east. Touch for map. Marker is in rest area. Marker is in this post office area: Cairo NY 12413, United States of America. Touch for directions. Other nearby markers. At least 8 other markers are within 4 miles of this marker, measured as the crow flies. Bell Factory (approx. 1½ miles away); Pachquiack (approx. 2.3 miles away); First Log House (approx. 2½ miles away); Mowers House (approx. 2.6 miles away); World War II Memorial (approx. 2.7 miles away); Town of Cairo (approx. 2.7 miles away); Old Inn (approx. 2.7 miles away); World War (approx. 3½ miles away). Touch for a list and map of all markers in Cairo. More. Search the internet for The Catskills. Credits. This page was last revised on March 6, 2019. This page originally submitted on March 4, 2019, by Steve Stoessel of Niskayuna, New York. This page has been viewed 43 times since then. Photo 1. submitted on March 4, 2019, by Steve Stoessel of Niskayuna, New York. • Bill Pfingsten was the editor who published this page.